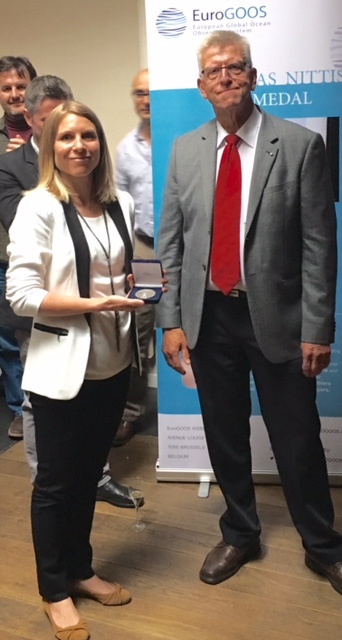 The Kostas Nittis Medal was awarded at a special session on 25 May 2016. This year's Medal and associated grant went to Angelique Melet, a young researcher from Mercator Ocean, France. The award ceremony took place in Brussels, at a special session of the EuroGOOS General Assembly 2016, bringing together over 50 representatives of 39 European ocean observing organizations from 19 countries. "It is an honour to be awarded the Kostas Nittis Medal, said Angelique Melet. The grant will give me a chance to present my research and activities at high-profile international conferences, and is an incentive to be more proactive in the oceanography community." Last year's winner, Pablo Lorente of Puertos del Estado, Spain, presented an impact report on his activities supported to the grant. He's been able to attend six conferences and deliver seven scientific papers, which helped to significantly advance his PhD. "The Kostas Nittis award has been a strong motivator for me, and a great opportunity", shared Pablo in this presentation.